Researchers at the University of Waterloo in Canada have directly entangled three photons in the most technologically useful state for the first time, thanks in part to superfast, super-efficient single-photon detectors developed by the National Institute of Standards and Technology (NIST). Entanglement is a special feature of the quantum world in which certain properties of individual particles become linked such that knowledge of the quantum state of any one particle dictates that of the others. Entanglement plays a critical role in quantum information systems. Prior to this work it was impossible to entangle more than two photons without also destroying their fragile quantum states. Entangled photon triplets could be useful in quantum computing and quantum communications -- technologies with potentially vast power based on storing and manipulating information in quantum states -- as well as achieving elusive goals in physics dating back to Einstein. The team went on to use the entangled triplets to perform a key test of quantum mechanics. "The NIST detectors enabled us to take data almost 100 times faster," says NIST physicist Krister Shalm, who was a postdoctoral researcher at Waterloo. "The detectors enabled us to do things we just couldn't do before. They allowed us to speed everything up so the experiment could be much more stable, which greatly improved the quality of our results." The experiments started with a blue photon that was polarized both vertically and horizontally -- such a superposition of two states is another unique feature of the quantum world. The photon was sent through a special crystal that converted it to two entangled red daughter photons, each with half the original energy. 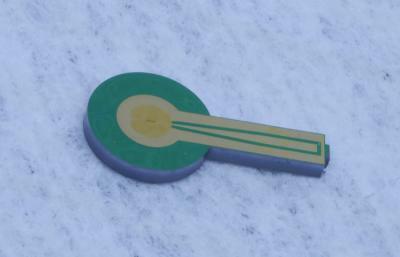 Researchers engineered the system to ensure that this pair had identical polarization. Then one daughter photon was sent through another crystal to generate two near-infrared granddaughter photons entangled with the second daughter photon. The result was three entangled photons with the same polarization, either horizontal or vertical -- which could represent 0 and 1 in a quantum computer or quantum communications system. As an added benefit, the granddaughter photons had a wavelength commonly used in telecommunications, so they can be transmitted through fiber, an advantage for practical applications. Triplets are rare. In this process, called cascaded down-conversion, the first stage works only about 1 in a billion times, and the second is not much better: 1 in a million. To measure experimental polarization results against 27 possible states of a set of three photons, researchers performed forensic reconstructions by taking snapshot measurements of the quantum states of thousands of triplets. The NIST detectors were up to these tasks, able to detect and measure individual photons at telecom wavelengths more than 90 percent of the time. The superconducting nanowire single-photon detectors incorporated key recent improvements made at NIST, chiefly the use of tungsten silicide, which among other benefits greatly boosted efficiency. To demonstrate the quality and value of the triplets, researchers tested local realism -- finding evidence that, as quantum theory predicts, entangled particles do not have specific values before being measured. * Researchers also measured one of each of a succession of triplets to show they could herald or announce the presence of the remaining entangled pairs. 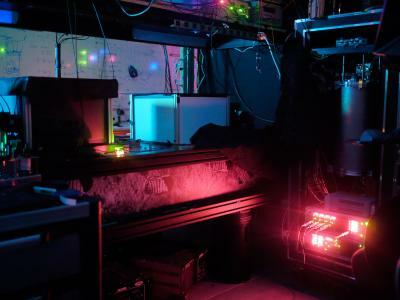 An on-demand system like this would be useful in quantum repeaters, which could extend the range of quantum communications systems, or sharing of secret data encryption keys. With improvements in conversion efficiency through use of novel materials or other means, it may be possible to add more stages to the down-conversion process to generate four or more entangled photons. The work was supported in part by the Ontario Ministry of Research and Innovation Early Researcher Award, Quantum Works, the Natural Sciences and Engineering Research Council of Canada, Ontario Centres of Excellence, Industry Canada, the Canadian Institute for Advanced Research, Canada Research Chairs and the Canadian Foundation for Innovation. * Specifically, the researchers calculated Mermin and Svetlichny inequalities, two tests of local realism. One result was the strongest-ever measured violation of the three-particle Svetlichny inequality, according to the paper.